Is the Sekhemka statue lost for good? Excavation work near Old Cairo's northern gate in the Gamaliya district could have revealed a segment of the original Fatimid wall. 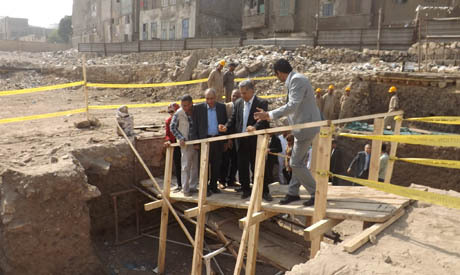 Antiquities minister Mamdouh Eldamaty told Ahram Online that if studies confirm the wall dates back to the Fatimid Caliphate (909 - 1171 AD) it will constitute an important discovery. Eldamaty said the whole original wall could feasibly be revealed. "This would be the first time a part of the original Fatimid wall has been found," Mohamed Abel-Azziz, the antiquities minister's assistant for Islamic monuments, told Ahram Online. Abdel-Aziz added that the development project being carried out in collaboration with the housing ministry at the north wall had not previously offered any discoveries. Studies of the newly discovered wall will begin immediately, seeking to confirm whether it is in fact an orginal Fatimid work. "The newly discovered wall could be from a different Islamic era; studies will provide answers," Abdel-Aziz said.